Brief Synopsis – The continuing adventures of Woody and Buzz. The group of toys try to save Woody who has been kidnapped by a ruthless toy collector. 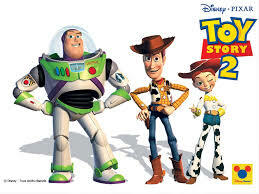 My Take on it – Pixar and Disney were prepared to release this sequel to Toy Story (1995) direct to video, but due to infighting within Disney, it eventually was left up to Pixar to decide what to do with the project and they decided (to all moviegoers eventual delight) to release it in the theaters. The story continues from where it left off and now Woody and Buzz have become good friends who now manage the other toys together. The animation is once again amazing and they really have put together a great story with an excellent message. Joining the original voice actors from the first movie (Tom Hanks, Tim Allen, Don Rickles, Jim Varney, John Ratzenberger, Wallace Shawn, Annie Potts and R. Lee Ermey) are Kelsey Grammer, Estelle Harris, Joan Cusack and Wayne Knight. This is definitely one of my favorite Pixar movies and the best of the 3 Toy Story movies. Bottom Line – Amazing sequel. Perhaps even better than the original. Highly Recommended!! I liked WALL-E (2008), but I don’t think it’s their best.